Before, office presence or ‘bums on seats’, would have been a good gauge of productivity – yet contemporary studies show that many workers believe themselves to be more efficient in extra-office locations. Airbnb’s Future of Work and Workers report found that remote and flexible working is growing rapidly with 84% of millennials stating that companies need to provide more remote options to attract talent whilst 71% of respondents said that person-person contact wasn’t necessary for their job role. Up until recently, directors, editors, VFX artists and producers would have never dreamed that working remotely from each other could become a reality. 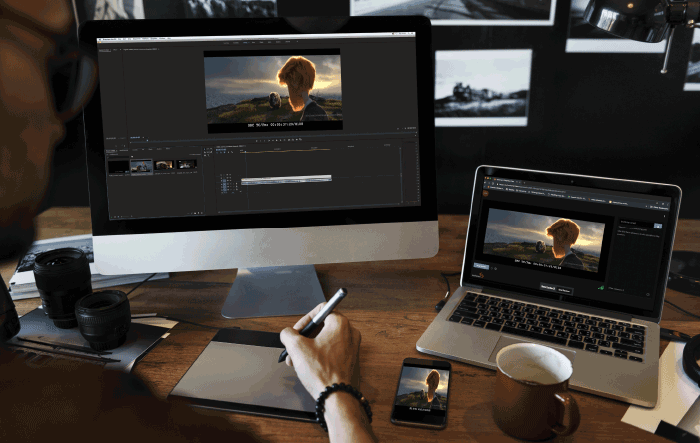 Yet, with the arrival of remote editing and viewing software solutions, heavyweight kit can be condensed into laptops, making physical location inconsequential. The use of software with real-time mobile viewing and editing capabilities means that progress has leapfrogged human interaction – instead able to rely on secure and fast private connection lines, bandwidths and ‘dial in’ platforms to make remote work accessible and efficient. In this interview, Sohonet CEO Chuck Parker, Pinewood Studios director of creative services technology Darren Woolfson, owner and co-founder of post-production company Coffee & TV Jon Trussler and Hire Works operations manager Simon Graham reflect on the evolution of remote work in the film production industry, consider the reality of even more dispersed working and look to a future of intelligent-software and scattered talent. Q> Remote work has made far-flung (and nearby) locations far more accessible than ever before. Has this opened up wider talent pools and logistical possibilities for your clients? Chuck Parker> Absolutely – directors, editors and producers have diverse schedules and commitments, often finding it difficult to re-convene once production has finished. This constraint used to mean that projects were hampered by time and cost, Now, with real-time solutions the entire process is opened up. Our clients, using our ClearView Flex software, are able to input from wherever, whenever. Sessions can be bespoke, flexible and responsive to the wider needs of the project – instead of being dictated by arbitrary schedules. Similarly, we’ve found the freedom of location has enabled companies to seamlessly relocate and expand, opening up second and third locations as the need for travel is minimized. The remote workflow means that our clients, can reach back into their original assets whilst working on something new – without facing a disconnect based on distance. Darren Woolfson> Interestingly, we’ve seen it translate into more work for our home teams as international clients have the freedom to work with our talent in the UK – rather than potentially having to settle for a closer solution due to geographical location. Q> How has this increased accessibility impacted project timelines and workflow efficiency? Jon Trussler> We’ve found that the outsourcing of heavy and time intensive rotoscope work to Asia has helped timelines exponentially. The project can be worked on while we sleep and picked up the next day – a massive efficiency boost. Simon Graham> The ability to do proper remote viewings – pausing and making notes whilst it’s actually going, has decreased downtime. We’ve also found that one of the most helpful facets of remote working software is its ability to connect people and locations that would be logistically impossible otherwise. Our clients use Sohonet’s ClearView Flex – a remote viewing and editing software, which enables them to ‘dial in’ with no necessary hardware at the other end. We’ve found that the freedom and accessibility connects worlds and has even made events such as cross-hemisphere screenings possible. Q> Outside of accessibility, what other benefits could be reaped from de-localised work? Darren Woolfson> Well, for centrally located facilities, the ability to site your hardware, equipment and machinery rooms at a different location to your most expensive real estate is a major budget-easing factor. This reshuffle will allow more expensive locations to become solely focused on revenue generating – potentially alleviating stretched budgets in the process. Chuck Parker> Our clients have found that the impact of unused dead time can hamper their productivity. For example, one of our customers uses the time it takes to travel from his home to his trailer house to review and approve content in real-time. He and his team have a set up whereby his thirty-minute uber commute to work can double as an efficient session – a slick solution to what could otherwise become dead time. Jon Trussler> It’s allowed us to have far more flexibility with our staff. Many of our senior operators live outside London and have families – remote working can really help some staff to be just as productive but also see more of their families – it’s a major win-win. Q> Looking to the future now, could remote work replace brick and mortar structures? Chuck Parker> There will definitely be more freelance workers over the next five years, not least due to natural evolution as companies compete against each other. In the same vein, I also think there are going to be a lot more smaller teams coming together – aided by the development and proliferation of modern enterprise sharing tools. It’s dead simple to get offices in the same virtual conference room if the software is there. Will this come at the cost of traditional office structures? It’s hard to say. However ‘office culture’ within a remote work environment can still thrive with careful cultivation. Take our teams for example, we like to force a scenario where people can catch up with their colleagues over a hot dog and a beer and maintain real-connections. A more intentional and relaxed water-cooler scenario, I would say. Jon Trussler> As cloud stream technology is increasingly adopted by the mainstream, location will become less and less important. Fast and reliable internet is crucial but we are now seeing companies where their entire storage of all media is in the cloud. That means the location of any of your staff is largely irrelevant – all they need is a monitor and a keyboard connected to the cloud and they can work anywhere! We’ve found that one of the best uses of our remote software – ClearView Flex, is that when working on instagram content I can set titles in Flame, whilst my client can see in real-time how well those titles read on their phone. Q> Okay, so if not a replacement of traditional offices, where is this trend going? Jon Trussler> One of the limiting factors with some remote post-work can be the internet speed at both ends. Hopefully, with the advent of 5G speeds, the bottleneck will be eased. Darren Woolfson> To backtrack slightly, remote work has been present in the post-production world for decades. Twenty years ago we used Automated Dialogue Replacement to re-record dialogue for episodic and feature film work. However, back then we would have to effectively run two sessions simultaneously, with multiple telephone wires, for the actor and the studio to ensure that video and audio line-up were seamless. An old example but one that shows the advancement of remote working technology and how the market for such capabilities was there then and is still today. As the tools improve even more and the quality of the audio and picture can be increasingly relied upon – that same market need will only grow. The proliferation of remote software can be seen as a direct response to the market need. To explore the future of content collaboration, get your guide to crushing it in Film, TV, AD and Video Production here.